“When I was in younger I wanted to be an architect!”. This is for sure one of the most common things architects hear. And when we do, we feel proud with ourselves (even a bit vain) and we end up not knowing what to say. 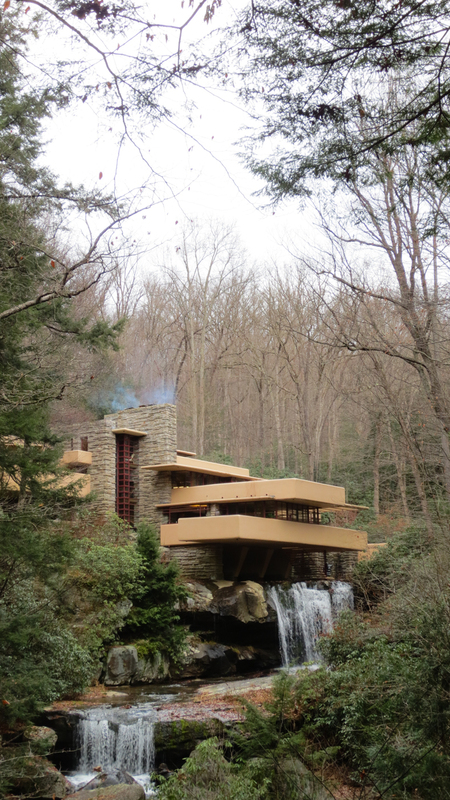 “That house made me want to be an architect” or “it’s a shame I didn’t visit it before, maybe I would’ve been an architect because of it” are all things that I’ve been hearing from people right after I visited the Fallingwater House. Those who share a deep passion for architecture might have seen it before in many books and documentaries. However, the experience of being there (! )… it excels everything one might expect. That happens with great human creations, of any kind. One thing is to see images of the Pantheon in school book when we are 12 years old, another thing is to she it around you. Any image that you might see from this house will also not reflect the experience that is to visit it (for that matter no image of whatever reflects the experience of living). The sound of the waterfall, the contact with the wall and floor materials, the sensations given by different temperatures, to understand the old trick of space “compression-decompression”, or even to share with visitors small anecdotes about the house or to find out the reason behind some of the details about the house, makes the whole visit unique. Apart from being a magnificent example of 20th century residential architecture, this house is also a testimony to the idea widely shared by architects (although also valid to many other occupations) that only time and commitment can make one better in whatever he or she wants to do. With architecture that tends to happen later on. At 67, Frank Lloyd Wright designed his most well-known house. He died before the finishing of another of his great creative works, the Guggenheim Museum. He is a tremendous example of perseverance and the pursuit of eternity. His works and his thoughts will remain in time because they connect with very profound aspects of the human nature. And these are timeless. However audacious this might sound, architects share this quality and express it through what they create in a way that is different from others. Even if it might seem similar to other areas, in architecture that translation is made in a much more physical an permanent way. Most of us would wish to be eternal. Some have the luck to be eternal through their descendants, others through their actions towards people. Architects, however can do it through all of that and through the creation of things and spaces that modify the life of people. And we do it even if we are already inside the box. And maybe that’s way so many people wished they were architects.